Lastnight I got on the phone with various robots to straighten out my personal bank crash. There was much reciting of the last four digits of my Social Security number, much saying "Yes," slowly and distinctly, and much junk hold music. 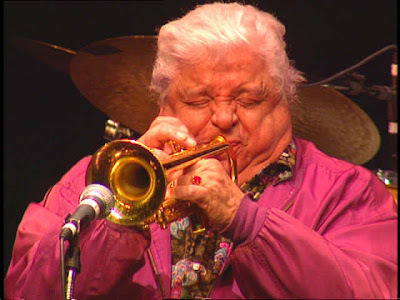 I think it was Maynard Ferguson, above, with those really high trumpet notes. I like Maynard Ferguson sometimes but not always. You do not want him blowing into your ear when you are trying to rescue your shambles of a checking account, that is for sure. Why do they have to play music at you at all? Because this is a delicate moment for you and it would be nicer if you could be free to listen to something decent. Also, why does the robot always have a woman's voice? Once in a while I would like to hear a man's voice. I am tired of these women's robot voices. They always sound like the ones you hear in science fiction movies, saying, "Bomb will detonate in 7.02 seconds." It was later than it should have been while I was making these calls. I had been on the phone with Leonard Pennario's friend Chuck, the developer in Honolulu, and before that I had been talking to Chuck's wife, Susan. These are people I have come to love. I get on the phone with them and I do not get off the phone. So here I am, finally straightening out my financial mess, and because it's so late, I just have to keep telling myself to keep calm, not get frustrated. Once, after I'd punched in all kinds of numbers and codes, the robot hung up on me and I had to start all over. That happens! You have to expect it. And this is a goodie: While the robot was in the middle of saying something, I cleared my throat. Nothing dramatic, just a little "ahem." And the thing stopped talking! There was endless silence! My little "ahem" had derailed the whole process! Ha, ha! You can take your little plastic game piece and go back to start! Well, M&T refunded some of my overdraft fees. That was so nice of them. I think they like it when you call and explain. They are like your parents. But one hilarious thing happened. When I was off the phone I wandered downstairs and I looked at the mail. I never look at the mail earlier, which is why I wind up in these situations. And there was an envelope from my church. It turned out two of the three checks that had bounced had been to them! This was on the last Sunday of 2008 and for New Year's Day, which is the Solemnity of Mary and I had gone to Mass then and kicked something extra into the collection. Father Secondo at St. Anthony's had helpfully enclosed copies of the bounced checks. In powder blue Magic Marker he had written in big letters: "OOPS." Aahahahahaha! My ortho's office, yesterday, said the same thing. At least I had not bounced a check to them. I had merely forgotten my appointment. I was supposed to go in yesterday and get my braces tightened, ow ow ow ow ow. Now I have to go in today instead. Hmmm. That gives me a positive thought and it is about time I had one. Last month, I got red and green braces for Christmas. I wonder what I should get for January. How about blue? It would go with the zero degrees Buffalo is supposed to get today. How about those zero degrees? It would also go with January's snow and sparkle. I am feeling better already.